In ancient times, immortal beings - the vampires - ruled the world from the shadows. Politics and assassinations soon bored these nocturnal creatures. For their dark amusement, the undead devised a game: The stakes were the blood and life force of their human pawns. Now that game is available to mortals. No blood will be lost, but the vampires' thirst for power endures through the strategies, tensions, and battle narratives of this rediscovered ancient diversion. 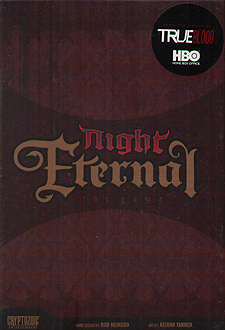 Based upon a game that exists in the True Blood universe, Night Eternal is a competitive card game of intrigue, bluffs, power-plays, and betrayal. Vampires jockey for influence, position, and ultimate control of the great rivals factions: The Authority and The Monarchy. Easy to learn rules! Within minutes, Agents and Immortals alike will be at your command.